It wasn’t known at the time, but that same year marked the beginning of the 2008-09 recession. It’s a recession that hit Ontario hard and the province is still feeling the effects. For instance, the employment rate of working-aged Ontarians has not yet returned to pre-recession health. Youth employment in Ontario took a hard hit during the 2008-09 recession; it has not yet returned to pre-recession health. Even in the face of these struggles, data showed that poverty reduction efforts were making a difference in the early years of the province’s strategy. Child poverty (as measured by two different data sets) fell by between 6.6[i] and 8.7[ii] per cent by 2010. Ontario can learn a few lessons from the experience of that first strategy. It is worth noting that the decrease in child poverty in those first two years transpired during the worst of the global recession. 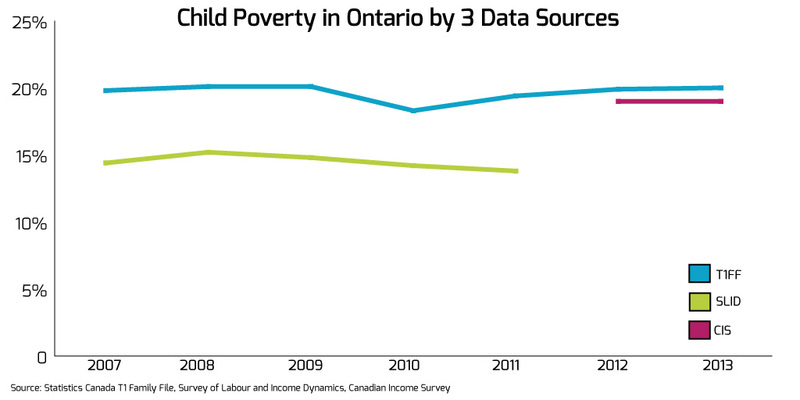 Without a strategy in place, child poverty in Ontario would have undoubtedly been worse during the recession. In fact, provinces such as British Columbia, where there is no poverty reduction strategy in place, saw an increase in child poverty during that same two-year time frame. The first two years of the strategy worked because the province dedicated robust resources to make progress a reality. And the government of the day maintained its political resolve right through to the recession’s end (it waned shortly after). The Ontario Child Benefit has proven to be a real workhorse: in 2009, the OCB was increased to a maximum of $1,100 annually per child in that year. By 2013, more than 530,000 families received a benefit worth a maximum of $1,210. The benefit increased to $1,310 in 2014[iii]. And in 2015, the Ontario Child Benefit was indexed to inflation to ensure families don’t lose the value of the benefit to the rising cost of living. But we’ll have to wait another year for the data to show the effects of this investment. Raising the minimum wage in 2008, 2009, and 2010— from $8 an hour in 2007 to $10.25 an hour by 2010—also made a difference, particularly for the working poor. Other significant investments included the implementation of full-day kindergarten for four- and five-year-olds and the introduction of Healthy Smiles Ontario, a program providing dental care for low-income kids. By all accounts the government’s poverty reduction strategy was working, but in 2012, it went off course. By budget time 2012, the political will to invest sufficient resources in poverty reduction had dissipated; the Drummond report was delivered and Ontario began a series of austerity measures—some of which remain in place today. In 2012, a promised increase in the Ontario Child Benefit was postponed by one year. The minimum wage was frozen at $10.25 an hour between 2010 and 2014. Without a steady commitment to fund and implement these portfolios, the early progress in Ontario’s child poverty reduction strategy began to unravel and by 2013, child poverty again sat at the same level it was at in 2008. Time will tell if the minimum wage and OCB increases of 2014 and 2015 made a difference for families. The government has (rightly) been criticized for failing to maintain its commitment to its own poverty reduction strategy. But government targets and timelines remain useful. They help to measure progress and to ensure governments who lose their way refocus and recommit. In 2014, the Wynne government recommitted to its child poverty reduction targets: instead of doing so by 2013, the province now hopes to reduce child poverty by 25 per cent in 2018—five years later than originally planned. The Wynne government also introduced phase two of its poverty reduction strategy, broadening out the scope to include a promise to reduce poverty for single adults and to eliminate chronic homelessness within a 10-year period (by 2024). Has the government learned lesson #3: Commitments require steady funding to yield results? In 2014, the OCB was increased to $1,310 a year and was indexed to inflation in 2015. The minimum wage increased to $11 per hour and in 2015, it was indexed to inflation. On October 1, 2015, the minimum wage was increased to $11.25 an hour. On October 30th the government committed to ending chronic homelessness across the province by 2025. It promised $10 million in local poverty reduction fund money right out of the gate, but no other financial commitment has yet been made. To their credit, government is still struggling with how to count the number of individuals experiencing chronic homelessness in Ontario – but financial commitments and timelines must come sooner rather than later. 26 grants have been awarded so far this year[v] and $10 million of the fund was diverted to initiatives that will end chronic homelessness. 895,000 Ontarians rely on social assistance to help meet their basic needs. Unfortunately, their total welfare incomes continue to be grossly inadequate, falling too far below the poverty line. In budget 2015, the Ontario government committed to consultations with clients, stakeholders and other partners on how to redesign the rate structure[vi]. Again, Ontario must ensure that the financial commitment made is sufficient to achieve the task at hand. Ontario has also invested time into important labour market reform intended to increase job quality and reduce precarity for low-wage workers. The Changing Workplaces Review and Bill 18: Stronger Workplaces for a Stronger Economy Act are moving Ontario in the right direction. In Addition, Bill 6: Infrastructure for Jobs and Prosperity Act ensures that communities will benefit from the jobs created when infrastructure is built. The Ontario government has been calling, for years, for the federal government to step up to the plate on poverty reduction. With the election of the Trudeau Liberals, Wynne may have finally got her wish. Trudeau’s mandate letter to the new Minister of Families, Children and Social Development sets the development of a Canadian Poverty Reduction Strategy as a top priority. The new federal government’s pledge to implement the Canada Child Benefit while eliminating the Universal Child Care Benefit and the Canada child tax credit is predicted to help Ontario exceed its child poverty reduction target ahead of schedule. Ontario will need its federal partner to do some of the heavy lifting when it comes ending chronic homelessness and expanding affordable housing units as well. Early signals from the new federal government heighten expectations that Ontario will be on solid footing to meet its phase two poverty reduction strategy commitments on schedule. As long as that political will remains steadfastly in place. A shorter version of this article appeared in the Toronto Star.